1 bed 1 bath unit in Croc's with extended balcony. It doesnt get any better than this. This condo overlooks the pacific ocean in the fantastic Crocs Casino and Resort. This makes an excellent getaway/vacation unit or a vacation rental for extra income. Just aside the Pacific Ocean and three miles from downtown Jaco, you'll have it all at your fingertips at Croc's Casino Resort. From the Las Vegas-style gaming to the spa, disco, swimming pool and beauty salon, there's something for everyone at this expansive locale. 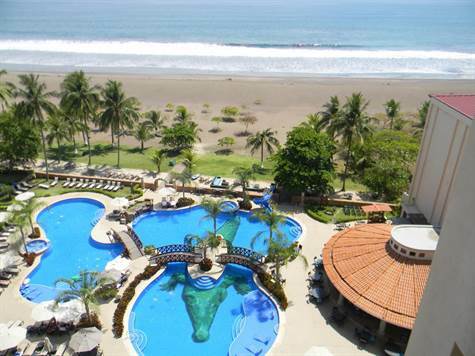 Warm ocean breezes and a laid-back lifestyle are calling for you at Croc's Casino Resort in Costa Rica. Boasting a list of on-site amenities that will bathe you in luxury and an oceanfront location, this is the ideal spot for a sun-soaked escape. Treat yourself to an indulgent spa treatment after a long day of paddling through the waves on your stand-up paddleboard. At night, you'll have access to a bevy of body-moving nightlife, discos, and casino attractions without even having to leave the property! No matter what time of year you decide to come and visit, you'll be able to surround yourself with a wide array of luxury options and stunning ocean views at our lovely vacation rentals. Nestled on the northern shores of Jacó Beach, this Costa Rican resort gives you the chance to revel in oceanfront attractions, unparalleled views, and easy access to cultural destinations. Set just two-and-a-half miles from the vibrant heart of Jacó, a great central location enables you to slip into the beach lifestyle while having direct access to everything you'll need for a memorable stay. Wake up to the sound of the crashing waves just outside your home away from home and make a quick, light breakfast with some local produce in your private kitchen as you make your plan for the day. Grab a spot poolside at one of the five-star pool locations and catch up with a good book while guests splash around. Rent a stand-up paddleboard to get in some exercise as you paddle past the surf and into the deep sapphire blue waters. Then take some time to stroll along the coast and snap a few pictures you can send to your jealous friends back at home. Head back and visit the resident crocodiles Paco and Lola to learn about the scaly local celebrities. After a day of hitting the pools, basking in opulent spa treatments, and maybe a quick workout in the fitness center, make reservations at one of the three mouthwatering dining options just steps from your vacation rental. Enjoy a meal with a Meditteranean flair at Adacus, or maybe a light bite of ceviche at Parsley n Pepper Restaurant. If you're looking for something a little more casual that allows you to still enjoy the outdoors, check out the menu at El Zarpe Pool Bar & Grill. After dinner, keep the party going with a night of dancing and laughter at Liquidity, the on-site club. Listen to the house DJ's spin the latest and best beats while skilled bartenders show off their mixing skills and create a truly decadent drink for you to enjoy. If you're looking for something a little slower, head over to the Las Vegas-style casino to try your hand at a few games of chance. With so many beautiful sights in Puntarenas Province, your only problem will be deciding which to see first. Just 51 miles south, you can take a hike on picturesque trails at Manuel Antonio National Park. Filled with lush landscapes, tropical wildlife, and sights that are postcard-ready, you'll want to make sure to bring your camera! Just around the corner from Jacó Beach, the long stretch of pristine beaches at Hermosa Beach are the perfect escape from the hustle and bustle of the daily grind. Pack a cooler and spend the day reveling in the peace of the ocean. Whether you're coming to Croc's Casino Resort to celebrate a monumental life event, or simply a well-deserved vacation, our vacation rentals at this luxurious oceanfront retreat offer the perfect spot to slip into the beach lifestyle. Serving breakfast, lunch and dinner every day in a family style ambiance. A menu with a variety of plates to please everyone on the table. Mediterranean Restaurant with a creative cuisine. Serving lunch and fine dining every day. The flavors of Italy, Spain, Greece and South France will delight your palate. Best wine selections, fresh seafood and imported fine cuts are the main guests in this menu.Add to that the fresh breeze coming from the ocean with an incredible view and you will be in heaven since minute one. Casino Bar-Serving tropical cocktails and drinks to enjoy a wonderful evening of entertainment at our Las Vegas Style Casino. Incredible setting to enjoy the sunset and the special events we will held for you. The best way to enjoy our beach front pool, with a delicious variety of snacks and cocktails.From the pool to the ocean and back, everything you want at hand to enjoy your vacation the way you deserve. Fresh brewed coffee with homemade baked goods, pastries and sweets. And of course our out of this world Italian Gelato! To further impress all guest, Croc´s opened in Costa Rica a Las Vegas Style Casino experience. There’s nothing like this in the country. Only at this Casino you will find the newest array of slots and table games. With the managing of experts of the gaming industry in Las Vegas, the Casino will be a living experience every day, with top service and entertainment in a tropical setting with ocean views. If you thought that was more than enough, at Croc’s Casino Resort you will find a sparkling pool just steps away from the beautiful beach, with El ZARPE pool bar to delight yourself all day in the sun. While in paradise you will be able to relax your mind, relieve stress and enjoy unsurpassed levels of pampering in the exquisite settings of the hotel Spa, with treatments specially designed for your needs. A Beauty Salon and Gym are also at your disposal. Retail shops are also inside the resort to cover last minute needs and to take home with you all the amazing souvenirs.